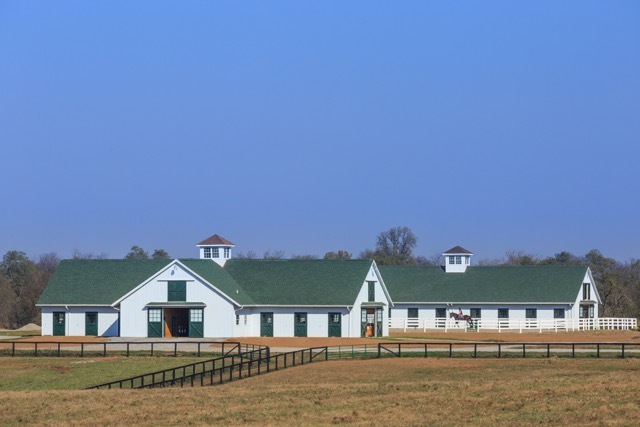 The state-of-the-art New Vocations rehabilitation center at Mereworth Farm in Kentucky. Since its founding in 1992, New Vocations has become the largest racehorse adoption program in the United States. 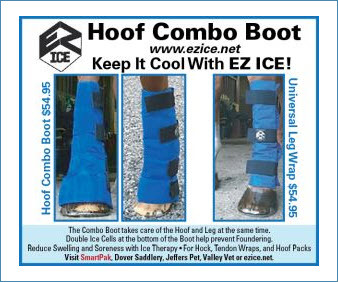 It was created to offer safety, rehabilitation, retraining and ultimately new lives to retiring racehorses, whether due to injury or performance. 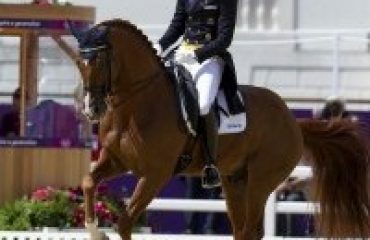 When horses leave racing careers, many are injured and most are underweight. Having been trained to be ridden only as a racehorse, retired racehorses would once have had no option but auction and likely slaughter. With the efforts of New Vocations Racehorse Adoption Program, these valuable horses have a safety net and the chance at a second career. New Vocations at Mereworth Farm. After taking in a racehorse, New Vocations not only rehabilitates and begins retraining, but matches the horse in a caring, qualified home to continue training in a new discipline. 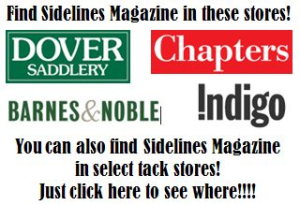 New Vocations follows up with each adopter, ensuring a successful transition. Since opening in 1992, New Vocations has placed over 6,000 horses from 40 racetracks, and expanded to multiple locations. Facilities include Laurelville and Marysville, Ohio; Hummelstown, Pennsylvania; Fort Edward, New York; and an expanded, premier facility in Lexington, Kentucky. New Vocations at Mereworth Farm is possible because of the Susan Donaldson Foundation, stewards of the 1,200 acre retirement home for racehorses. Founded in 1924 by Walter J. Salmon Sr., Mereworth Farm has been involved in the racing industry for nearly a century. It was Walter’s granddaughter, Susan, who acquired Merworth when her father died and created her foundation to preserve Mereworth perpetually as a nursery for unwanted horses. After Susan passed away in 2011, the Foundation worked to restore Mereworth to a working rehabilitation facility. Furthering the impact of Susan’s dream, the Foundation offered New Vocations a free long-term lease of 85 acres on Mereworth Farm to build the largest rehabilitation, retraining, rehoming and retirement facility in the country. The facility, which is near completion and officially opened in April 2016, will double New Vocations’ capacity with only a 25 percent increase in operating costs because of the Susan Donaldson Foundation’s support. 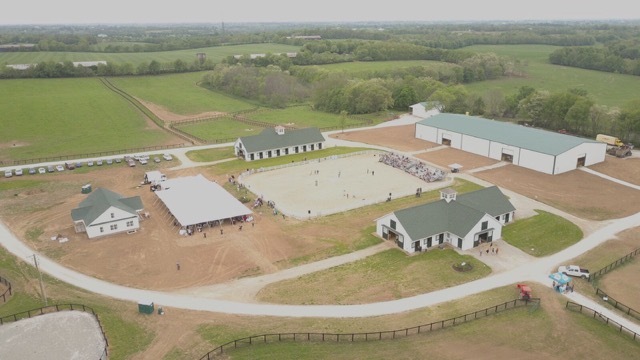 In the year following opening, New Vocations at Mereworth Farm rehomed 120 horses — a number expected to dramatically increase when the facility is complete and fully operational. Anna Ford, the Thoroughbred program director for New Vocations, adopted Discreet Treasure in 2010. In addition to guests and potential adopters, support at the Open Barn & BBQ event came from professionals who recognize the horses’ talent and love Thoroughbreds as a breed. 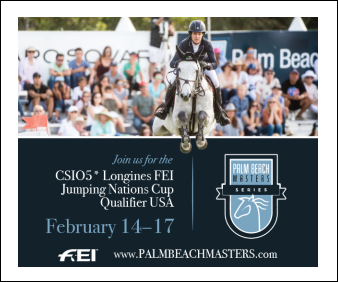 International event rider Dorothy Crowell and her ex-racehorse Tom Swan, now shown as ThisisGonnaBeFun, demonstrated the natural athleticism of Thoroughbreds by jumping a course of show jumps. Afterwards, Dorothy shared her love for Thoroughbreds with the crowd in an interview with emcee Jen Roytz, aftercare advocate and writer. 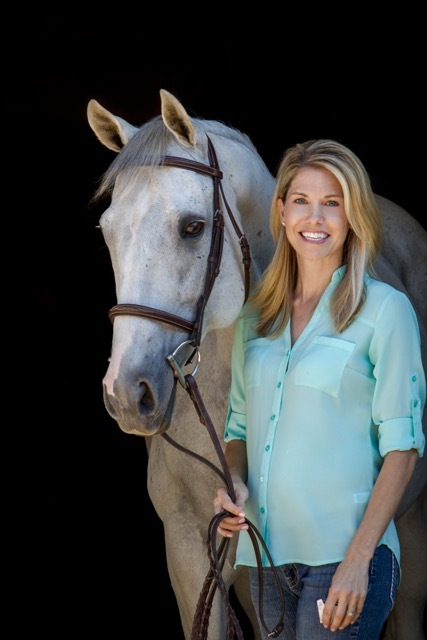 Valerie Ashker spoke of her adventures riding her off-the-track Thoroughbred across the entire country to raise awareness of the strength, stamina, courage and versatility of retired racehorses. Finally, Lindsey Partridge, the Retired Racehorse Project’s 2016 Thoroughbred Makeover Trail and Freestyle Champion, spoke about training while demonstrating in blustery weather. 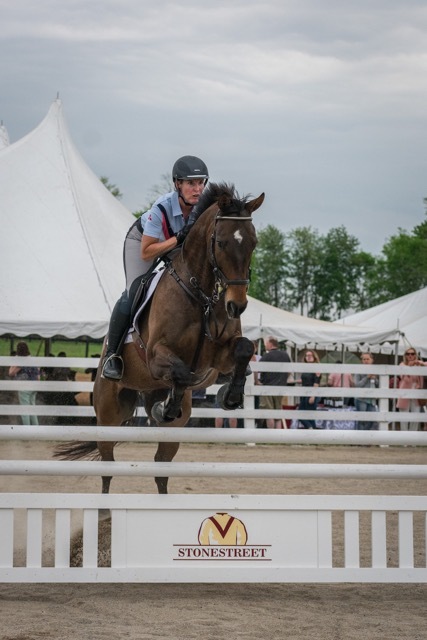 International event rider Dorothy Crowell jumped a course with her own Thoroughbred Tom Swan at the New Vocations Open Barn & BBQ. Support for New Vocations also comes from the racing community itself, and the trainers, breeders and owners who want to make sure their horses have happy lives after the track. The owners of TAPWRIT, who finished sixth in the 2017 Kentucky Derby, pledged a percentage of their Derby winnings to New Vocations. 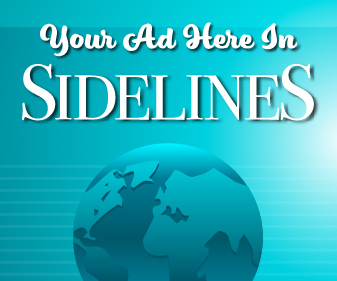 Owners Bridlewood Far, Eclipse Thoroughbred Partners and Robert LaPenta have all been ongoing supporters of New Vocations’ aftercare efforts. 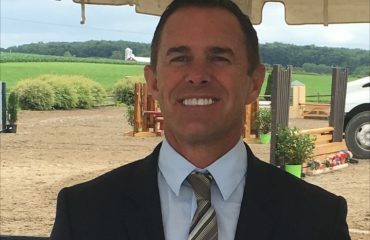 Todd Pletcher, trainer of winning Kentucky Derby horse Always Dreaming, was awarded a Limited Dodge Ram pickup truck and in turn donated the truck’s value to Thoroughbred Aftercare Alliance and New Vocations. 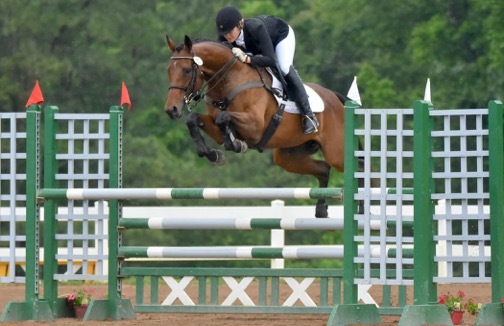 Additionally, the program’s largest fundraiser and exhibition of Thoroughbred talent is the New Vocations Charity Horse Show Series, which kicks off June 30–July 2 in Delaware, Ohio. With such continued support, New Vocations will continue to find perfect homes for every racehorse that goes into the program. 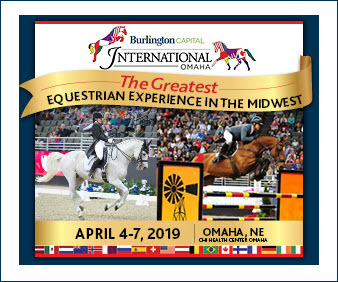 For more information, visit NewVocations.org.